If care is not taken, just like the newspaper industry is dying due to digital media, most online publishers will struggle to stay afloat. While Facebook claims that Instant Articles are aimed at delivering a better experience to users, this doesn’t change the fact that it is taking away control from publishers, and experience shows that it has always been difficult to monetize content you can’t control. 20 percent more likely to click on Instant Articles than web pages. 70 percent less likely to abandon Instant Articles due to poor user experience; in essence, readers will spend more time reading. 30 percent more likely to share Instant Articles than web pages. 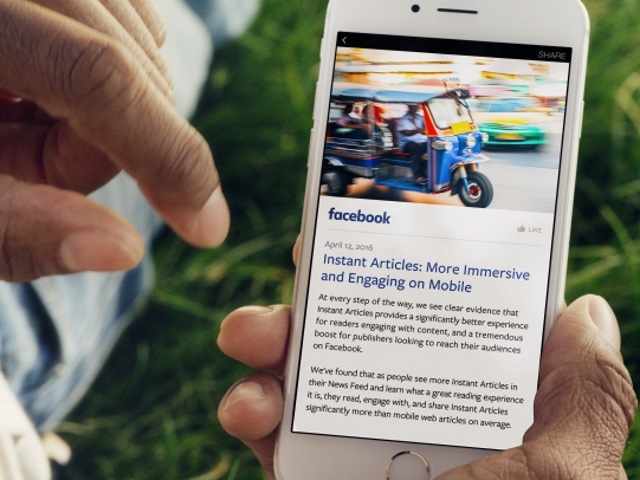 With the above statistics, Facebook’s Instant Articles are a win for publishers, right? Not necessarily. According to data from HubSpot’s recent Digital Publishing Benchmarks Report, publishers are finding it increasingly challenging to compete with free content on the web; the report shows that a whopping 78.4 percent of respondents are compelled to offer free content of some sort, yet publishers are barely able to monetize this content. Interestingly, available statistics show that since January 2015, Facebook referral traffic to publishers has dropped by 32 percent, while user interaction on Facebook has increased nearly threefold. Facebook is winning at the game of getting people to spend more time on its site while increasingly reducing the number of people that visit publishers’ sites. Instant Articles will only worsen things, and, depending on how you approach it, this could be a win or loss for you. In an era where publishers are struggling to monetize free content on their platform, having your content hosted on platforms you can’t control (such as Instant Articles) doesn’t seem like a win. However, with the data showing that articles hosted on such platforms are getting more views and better reads, what should smart publishers do? Native ads: Thankfully, with Instant Articles, Facebook allows some flexibility with advertising. Facebook recently announced the possibility of using native ads in Instant Articles, and this has been a very welcome development. In fact, a recent study shows that average click-through rates for premium native ads on mobile increased by 137 percent in the first quarter of 2016 versus the year-ago period, compared with desktop, and that this is expected to further go up as Facebook Instant Articles and Google AMP expand. While publishers don’t exactly own Facebook, they will have a level of control over native ads that appear in their Instant Articles, and the fact that Facebook also allows publishers to integrate Instant Articles with major tracking and analytics tools makes it easy to convince advertisers with viable statistics. In light of this, Instant Articles is basically an extension of your platform, and it’s much easy to convince sponsors. That said, Instant Articles can help you command even more from native content. Based on the fact that Facebook’s data shows that Instant Articles get more views and engagement, the increased readership gives publishers an opportunity to earn more from native ads. In-article video ads: Facebook introduced video ads to Instant Articles in May, thus making it easy for brands to add pre-roll, mid-roll and post-roll video ads. It’s time to create a strategy that allows you to monetize your Instant Articles with video ads.